I've been saying this for weeks. So excited to make homemade ravioli. Ever since I made homemade spaghetti with my pasta attachment for my Kitchenaid mixer, I couldn't wait to get my hands on some sutffed pasta. As my faithful blog readers are aware, I was recently abiding by a strict, low-carb diet for a couple months. I'm not necessarily going fully off-diet and eating whatever I want, but our unofficial deadline of our Mexico trip sort of sealed the cutoff for strict no-carb living. Enter these delightful pillows of pasta dough and mushrooms and cheese and butter. Speaking of those fillings. I decided to do a mix of fresh and dried mushrooms. The dried were porcini, which I rehydrated in boiling water (Reserve the soaking liquid in case you need it for the filling and/or the sauce). The fresh were trumpet mushrooms, which I finely chopped. 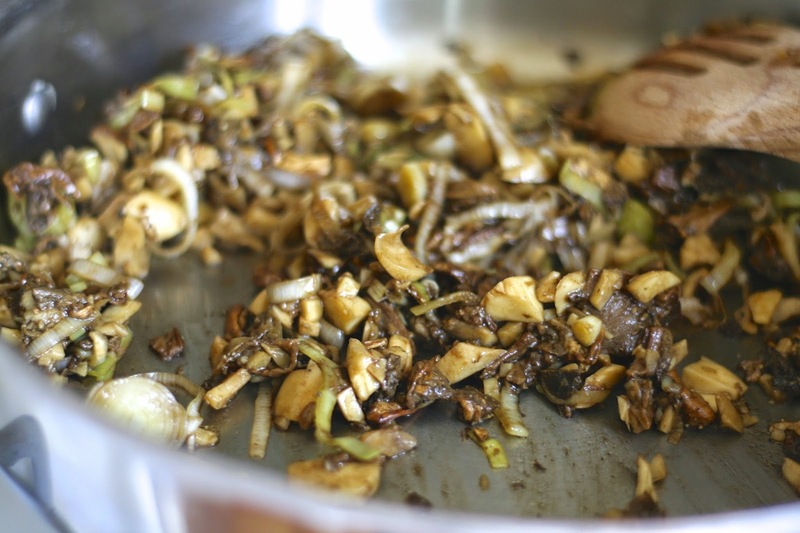 (*NOTE: Don't forget to strain and rinse the dried mushrooms to remove any "grit"). I also wanted to incorporate leeks. 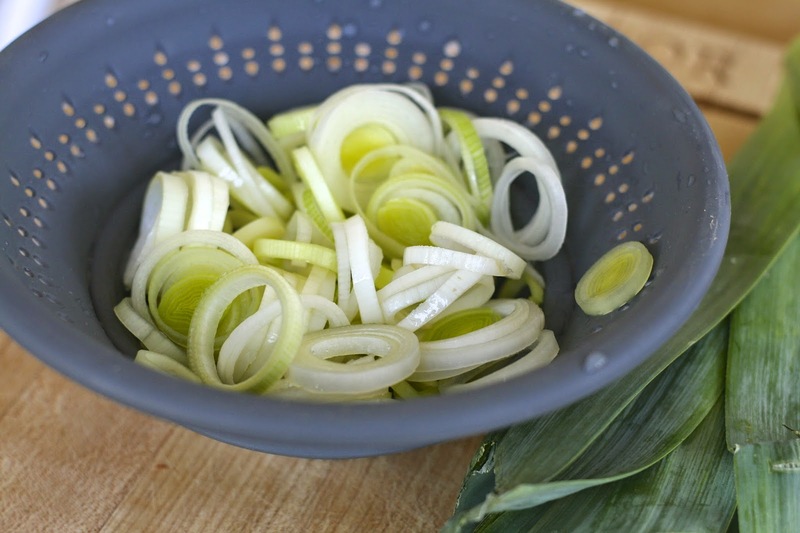 Leeks can be very dirty and gritty, so it's important to rinse them thoroughly after slicing. I used the white and light green portions only. Saute leeks in a little olive oil, until starting to turn soft and translucent. (I wanted to incorporate leeks into the sauce, so I removed about 1/4 cup of them before adding the rest of the ingredients). Then add two cloves of minced garlic and the fresh mushrooms and saute until the mushrooms release their moisture. Add in the chopped, rehydrated porcinis If you feel the mixture is getting dry, you can add some of the strained, reserved mushroom broth. Season with sea salt and fresh cracked pepper and stir in fresh parsley. From here, transfer to a bowl and mix with 1/2 cup of ricotta cheese. Just enough to bind everything together. I also threw in some Parmesan for good measure. Now for the pasta. I thought about doing whole wheat as I did with the spaghetti or gluten free, as I did with the gnocchi. But in the end, I decided to do a regular ol' pasta with half all purpose flour and half semolina flour. When buying dried pasta, you might notice that many times it uses durum semolina flour. I believe it's a little heartier than more refined flours, and holds up better for pasta. But you can certainly make it without semolina. Semolina is a LOT heavier than normal flour, so it's very important to start out with less than you need and add more as you go along. I learned this the hard way. I basically did 1 egg per 3/4 cup or 3 ounces of flour. To use up all the filling, I made the dough twice. Start by making a mound of the two flours thoroughly combined, along with some salt and pepper. Slowly incorporate the eggs and then knead for about three minutes, adding more flour if needed, until you have a big round ball of dough. Initially, the dough will be sticky and tough to work with... so a bench knife can be your friend here to help scrape up the bits. (BTW, the process is more detailed here.) The finished dough should be slightly wet feeling, but not sticky. If it feels sticky, add more flour. If it feels dry, add a little water by wetting your fingertips. I found this dough to need less flour than I did with my spaghetti, which was a drier dough (and a bit more forgiving). (Note: I wouldn't recommend making the dough ahead of time. Make it the day you plan to make your pasta). Wrap dough in plastic wrap and allow to rest at room temperature at least 20-30 minutes. When you're ready to make pasta, tear or cut off a piece about the size of your palm. Begin rolling it at setting #1, folding it in half or in thirds a few times before moving onto setting #2. Dust with a little bit of flour if dough begins to stick at all. Continue working until you have a nice, thin sheet at setting #4 or #5 (or whatever your pasta roller recommends). I used this particular ravioli mold, but you can totally do it free-hand if you'd like, or try individual ravioli stamps for bigger ravioli. If you are using a mold, be sure to sprinkle it with flour. Drape a sheet of pasta and gently press into the openings. Fill with the mushroom mixture and gently press down. Top with another sheet of pasta and dust with flour. 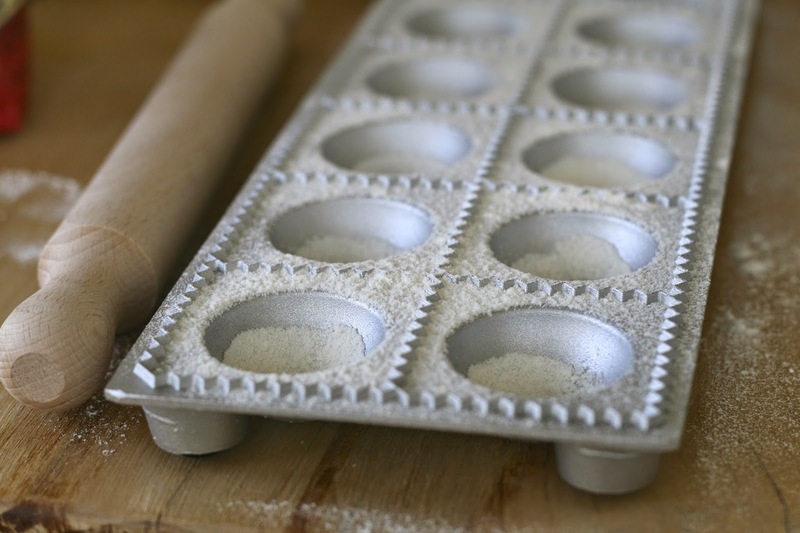 Use the mini rolling pin to tap down on each ravioli to get the filling to drop into the mold. Then, using a rocking motion, roll over the mold to cut the raviolis. Transfer to a baking sheet dusted with semolina flour and allow to dry slightly. Look at them!! SO, so pretty. If you aren't planning on eating the pasta right away, I recommend freezing them. 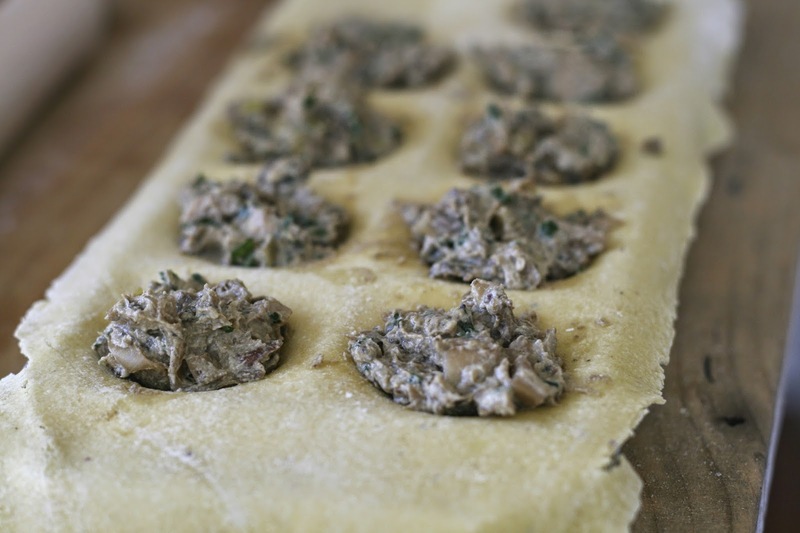 Simply pop the slightly dried ravioli into the freezer on the sheet pan. Allow to flash freeze for about an hour and then transfer to resealable plastic freezer bags. 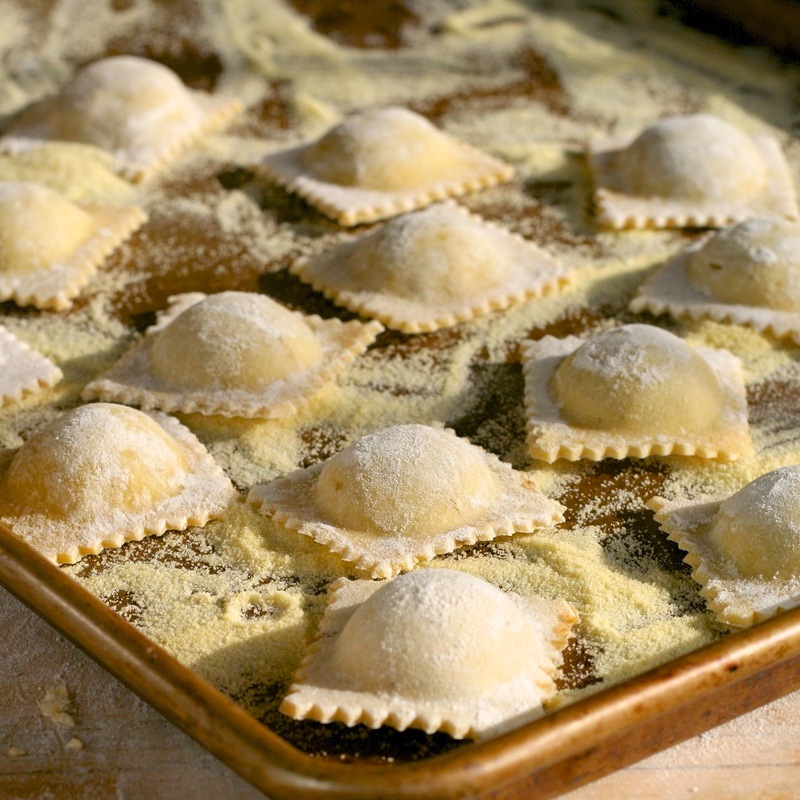 To cook, drop fresh OR frozen ravioli into a pot of salted boiling water and cook until they begin to float (just a couple of minutes). From there, you can finish with your favorite sauce. Since I wanted to highlight the mushrooms, I decided to do a simple sauce of butter, mushroom broth and chives. I topped with more chives, some of the sautéed leeks, shaved Parmesan and toasted hazelnuts. (But would also be good with a simple marinara sauce). Mix together the two flours, the salt and the pepper. Create a mound on a cutting board or clean counter. Make a well in the center and crack the eggs inside. 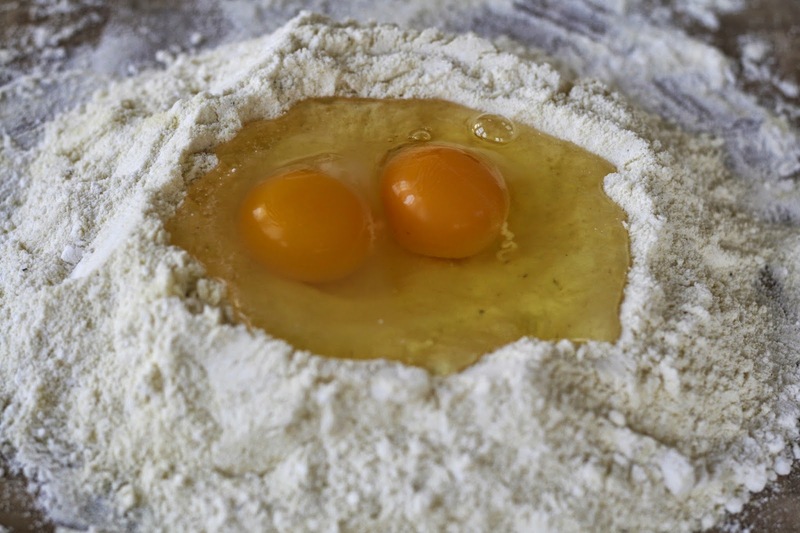 Using a fork or your fingers, begin gradually incorporating the flour into the eggs to mix the dough. A bench scraper is useful for scraping up dough during this process. Knead the dough with the heel of your hand for about three minutes until smooth. If dough becomes too dry, wet your fingers to incorporate a little moisture. If it's too sticky, add a little more all purpose flour until you have a smooth dough. Wrap in plastic wrap and allow to rest about 20-30 minutes (can rest longer, if needed). While the dough is resting, make the filling. 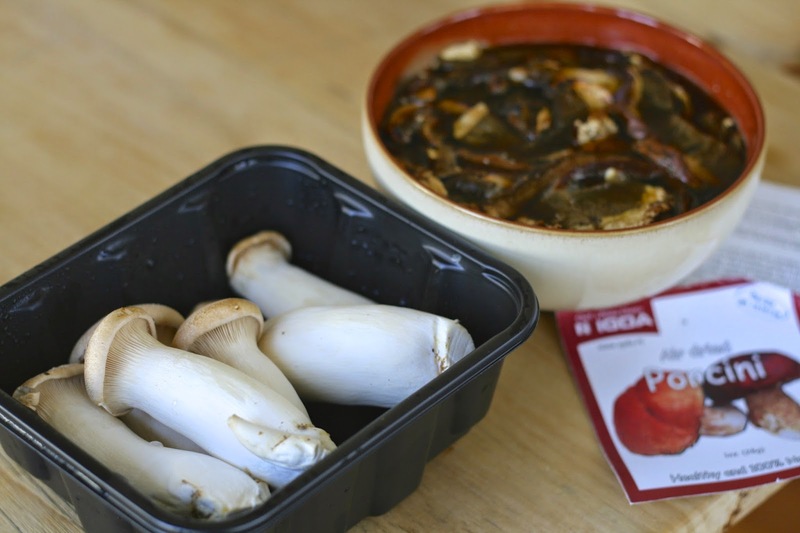 Place dried mushrooms in a bowl and cover with boiling water to rehydrate (about 15 minutes). Strain mushrooms, reserving the broth. Rinse mushrooms to remove any grit and chop. Chop fresh mushrooms and set aside. Slice leeks (white and light green portions) and rinse. Heat olive oil over medium heat and saute leeks until soft and translucent. Add in garlic and fresh mushrooms. Saute until mushrooms release their liquid, and add the rehydrated porcini mushrooms. If mixture becomes dry at all, add a little bit of the reserved mushroom broth. Season with salt and pepper, remove from heat and stir in parsley and cheeses. When you're ready to make pasta, tear or cut off a piece about the size of your palm. Begin rolling it at setting #1, folding it in half or in thirds a few times before moving onto setting #2. Dust with a little bit of flour if dough begins to stick at all. Continue working until you have a nice, thin sheet at setting #4 or #5 (or whatever your pasta roller recommends). 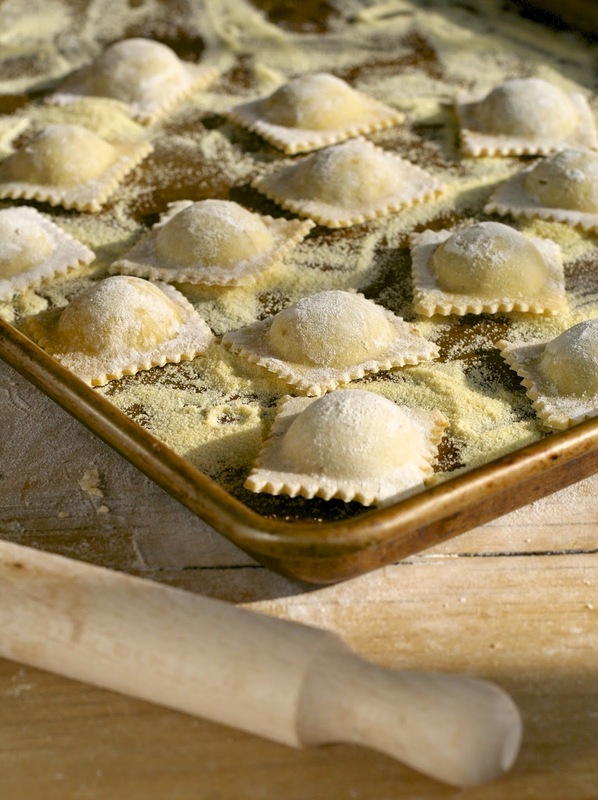 If using a ravioli mold, dust with flour, drape a sheet of pasta over the mold, and fill with the mushroom mixture. 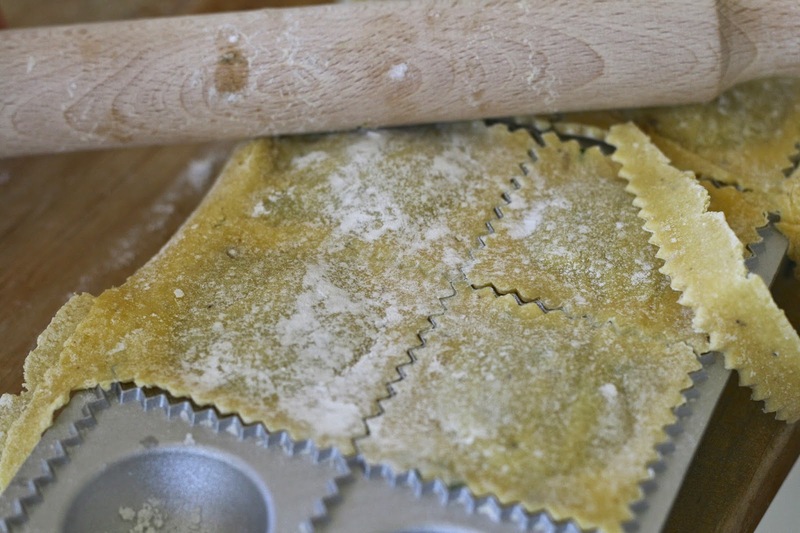 Top with another sheet of pasta, dust with flour, and cut raviolis. (You can also do this by hand if you don't have a mold). 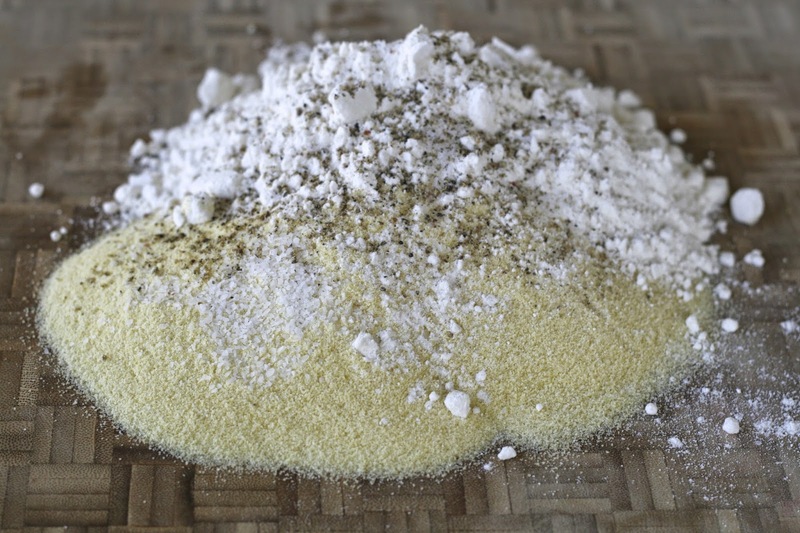 Transfer to a baking sheet dusted with semolina flour. 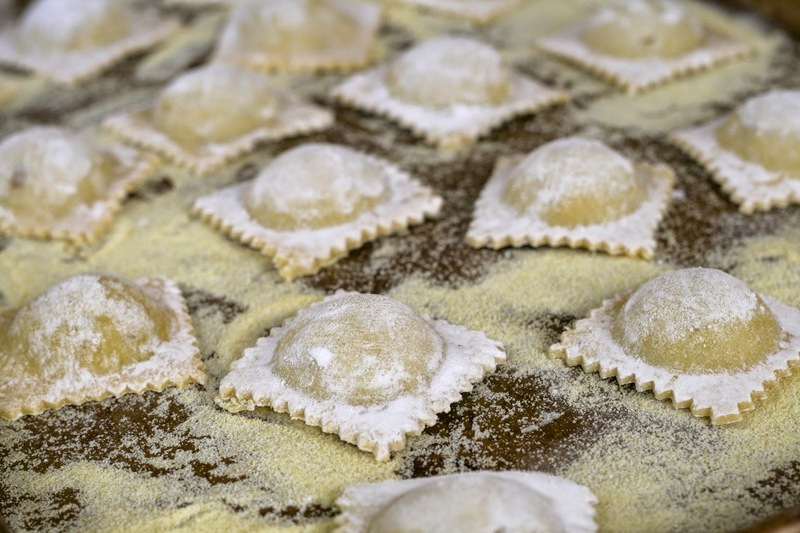 To cook, drop fresh OR frozen ravioli into a pot of salted boiling water and cook until they begin to float (just a couple of minutes). Toss with your favorite sauce and enjoy immediately! What lovely ravioli! I also often use semolina in my pasta, although in different proportions than you have here. I find that it imparts a welcome "bite" and spring to the pasta that is particularly well suited to hearty fillings, such as the one you show here. 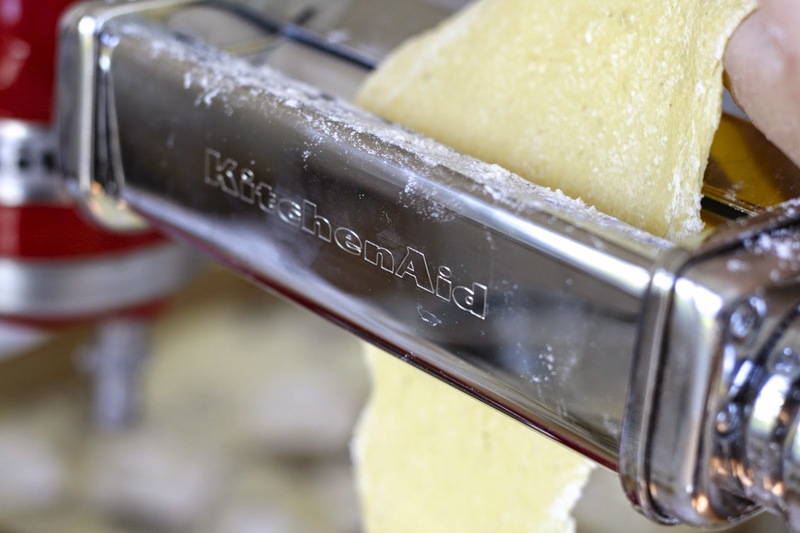 There are so many ways to form ravioli, from the plaque you have used, to cutters of all shapes and sizes, to rolling pins and completely by hand using only a knife to cut the dough and a fork to crimp it. I think everyone loves ravioli. I certainly do. 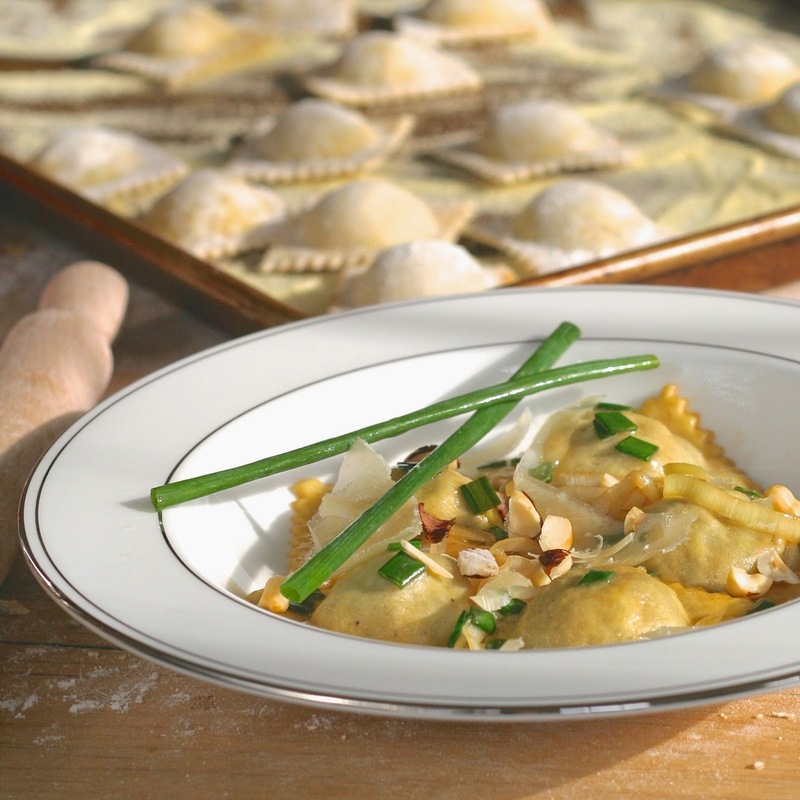 Some of my fondest childhood kitchen memories are all about making ravioli with my grandmother. This is my first visit to your very lovely site. Complimenti!